As you know I rarely travel without my iPod and if I’m alone, I almost always have it on. As I don’t drive, I get plenty of walking time to and from work, church, etc. My playlist is compiled of mainly Christian music and a number of other songs that I find uplifting or inspiring, even if they are not by Christian artist or have a Christian theme. So I’m not actually sure when I started doing this, but it’s something that I noticed myself doing a few weeks back. That is, when I hear a song which provokes a strong feeling or message to me, I find myself walking with my left arm outstretched to my side and my hand firmly clenched. As I say, I don’t actually know when I started doing it or even why, I just realised one morning that I was doing it and that it wasn’t actually the first time. I knew it felt as though I was reaching out to hold the hand of the Lord, I knew that is what I was doing, I just didn’t really know why I was doing it. Then yesterday I took my daughter into town to pick up a few things and meet a friend and his daughters for a coffee. When my daughter was younger she would hold my hand all the time, when we were walking together, now she is eight she’s happy to walk alongside me, or should I say run alongside me, due to my habit of walking fast. Yet I am content for her to cross the road without holding my hand, as long as I know she is by my side and it is safe to do so. But yesterday, after crossing many roads within the town, we came to a slightly busier road, she was by my side and when it was clear I looked across to her and said okay let’s cross and we set off. It was at that point that I felt her reach out with her left hand and tightly grasp my wrist as we crossed the road. There was no danger, we had already crossed many roads, it was safe to cross, I wouldn’t cross with her if it wasn’t, if I felt she was worried I would have reached out myself and taken her hand. I guess she reached out for security, to feel safe, though she had crossed many roads with me there, this time she needed the comfort of holding on to me, to make sure she made it across safely. It was then that I realised she did exactly what I had been doing, reaching out for the security of the Father to get through when I felt insecure. A few weeks ago I came off the anti-depressants, since then I have suffered from dizzy spells, although these are becoming less frequent, there are times where I guess I still need to feel that security, that I although I may have already crossed many roads, I still need to know that I can reach out and grab the hand of the Father to feel safe when crossing the busier roads. It’s funny how we learn things, yesterday I learnt from the actions of a child, that even now I am still a child that needs the comfort of the Father. This entry was posted in Faith, Walking and tagged Awakening, Christ, Christian Rock Music, Daughter, Faith, Freedom, God, Hope, Inspiration, Jesus, Jesus Culture, The Father, Walk With Me, Walking on August 10, 2014 by waynemali. Just when I was feeling that old fear were beginning to rise up once more, I found this verse and was reminded of this song, a song which has helped me in the past. 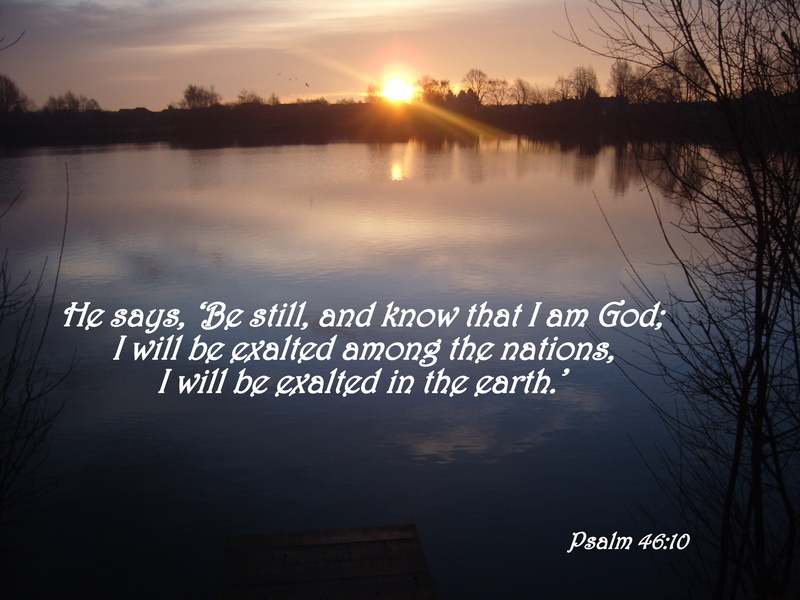 This entry was posted in Faith, Verse of the Day and tagged Be Still, Bible Verse, Christ, Christian Rock Music, Faith, Fear, Freedom, God, Inspiration, Jesus, Psalm 46:10, Storyside:B on April 19, 2014 by waynemali.